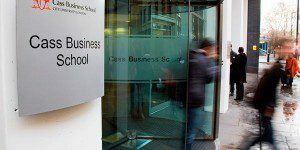 At the end of each year, Cass Business School at City University London looks back at their MBA success for students and alumni. For 2016, Dr. Sionade Robinson, the Associate Dean of the MBA Programs, had a lot of top news and events to celebrate. It all started in January with a high ranking by the Financial Times ‘Full-Time Global MBA 2016‘ list. For 2016, Cass Business moved up eight places ranking 37th in the world, 13th overall in Europe and 6th in the UK. Last February, Cass MBA student George Watson won first place at the annual BusinessBecause Global MBA Competition. He followed that up with another award in March with FTMBA alum Pearce Watson, winning the prestigious Lombard Prize. Then, in April, Cass Business held its flagship MBA elective, the London Symposium, which focused on “Explorers & Discoveries.” The symposium welcomed Sir Alan Yarrow as the main speaker. “The Symposium provides our students with networking opportunities and access to some of London’s most influential figures across business, finance, media, culture and sport. We mix thought leadership in plenary sessions with a ‘backstage pass’ to some of London’s most iconic locations, brands and organisations which drive the city’s prosperity – from the Treasury to the Ministry of Sound; Central St Martin’s to Lloyds of London and from Soho to Savile Row,” Dr. Robinson told the school in a news release. Also in April, Michael Williamson, another FTMBA student, won the Bloomberg Investment Ideas Challenge 2016 followed, in September, by a group of EMBA students making the finals in the Financial Times MBA Challenge. Then, in October, Tom Ilube, an MBA alum, was named Britain’s most influential black person on the Powerlist. Also in October, Dr. Tom Peters gave an exclusive MBA masterclass to students. Finally, for the last two months of 2016, the successes kept coming. In November, Douglas Markey, another MBA alum, won an annual prize from the Worshipful Company of International Bankers for his dissertation, and MBA alum Khalid Al-Qaqa received the Forbes Middle East Global Meets Local Top Executive Management Award 2016. And, last but not least, in Decembe, MBA alum Mark Sherwin, was named number three in Drum’s Digerati 2016, for the most influential individuals in the UK’s digital landscape.